Surfin’ the web, you know, often is a good way to find interesting events, cool people although still unknown, new magazines or forthcoming books, emerging groups and so on. One link leads to another and you are thrown from Paris to London, from New York to Sidney. “Doin’-things, seein’-people” in the net, we hit on the Brooklyn Night Bazaar, a huge market that take place every time in a different part of the popoulous burough of New York and that hosts more than hundred exhibitors, numerous artists, designers, video-makers and then chefs, live music and dj sets (nothing is missing). During the last edition, that took place on 15/16/17 of December, Canyon Castator had his stand and he aroused our curiosity, between all the others. Canyon is 22 years old. Canyon paints. Canyon skates. 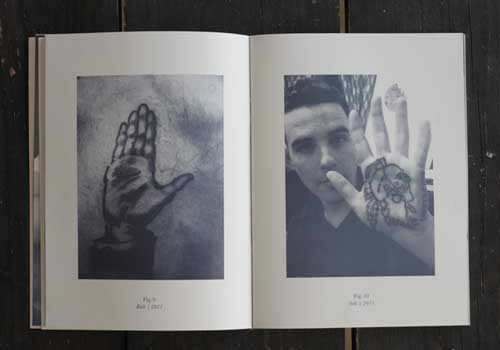 Canyon tattooes and got together the most “stupid” ones, home-made on his victims-test-friends, in a zine named Untitled- Ink on Skin, edited in 400 copies. Poliedric, multiform, maybe just young and free to do what he likes, in a City like New York where you can do (and be) whatever you want. We asked him some questions and he- pleased- answered to us with sharp disenchantment. Painter, tattooist, skater. Who is Canyon Castator? “21 year old degenerate painting contemporary portraits”. Can you explain the meaning of this description? My father is an artist. He works primarily in sculpture, and is incredibly experimental. He had me drawing from a very young age. Supplying me with the necessary tools, he taught me how to see, and then left it to me to learn to draw. Looking at your paintings I see something by Egon Schiele and something by Edward Munch. What is your inspiration? My initial reaction to Schiele was incredibly powerful. I was introduced to his work by my aunt during a stay with her in Florida. She recognized a similar confidence of line in my work, as I was primarily drawing in pen and ink without a preliminary sketch. I had no idea why people made art before having seen his work , and he made it effortlessly clear. It was after that trip that I began to paint. Recently I have payed homage to his relentless inspiration by having a drawing of his tattooed across my ribs and stomach. I’m always looking for new inspiration, a new interpretation of idea. Most recently I’ve been looking into the print work of Jim Dine. Have you exposed your works already? I’m currently preparing for my first one person painting exhibition. Ken Farmer, creative director of Nuit Blanche New York, is curating the show. Let’s talk about the zine “Ink on Skin”. How has it come out? 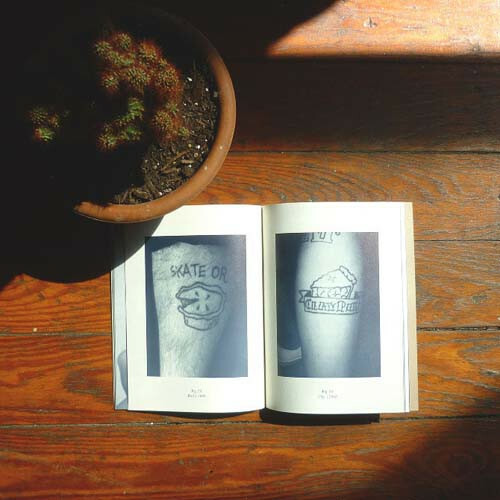 The zine, “Untitled, Ink on Skin”, was a collaborative piece documenting four years on tattoos I’ve given from home. While at one time it exposes the furtive D.I.Y. tattoo culture, it’s also a forum of my personal development in the medium. One of the designers of the book, Richard Angus Duff, frequently appears shirtless, ostentatiously sporting a new tattoo. It was printed in New Jersey. I was able to go on press and meet the foreman overseeing the project. He was happy to pull back his sleeves and show off his well worn army tattoos. 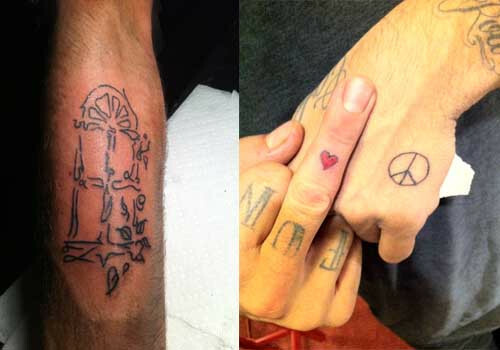 Your tattooing style is pretty far from your painting style. How do you combine these two artistic expressions? I view the two as very separate vehicles. If I was tattooing to replicate painting, even my own painting, it would be a falsification of the medium. 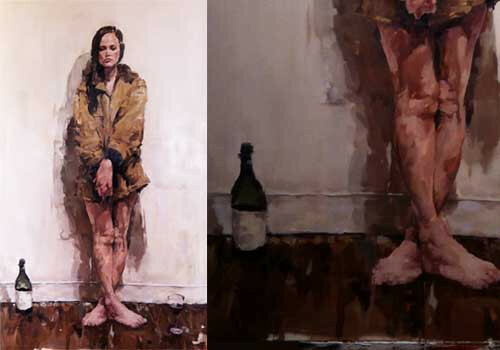 The subject and intention should compliment the process in which it’s created. D.I.Y. culture is mainstream again, there’s always a reference to it today (your zine is an example). Are you a “do it yourselfer” too? I’m teaching myself to paint in oils. I work constantly to expand my understanding of the medium. It’s rewarding and I continue to be informed by a self-made and unique education. Having a good sense of humility is key to any DIY endeavor. You’re very young- only 22. What do you want to do when you grow up? I don’t think I have any control over that. Growing up so close to a working artist I was incredibly disenfranchised with the idea of becoming one. Why would anyone would work so hard for so little? Pushing and pulling, back and forth working something to a point of satisfaction to have someone’s simply stop, take a brief glance and throw a sorting label on it. My dad made these thing because he had to. He had no say in the matter. I’d love to do something easier, be a lawyer or something, but as of now I can only do what my personality will allow me to. I don’t know if that will change. Any plan for your (immediate) future?